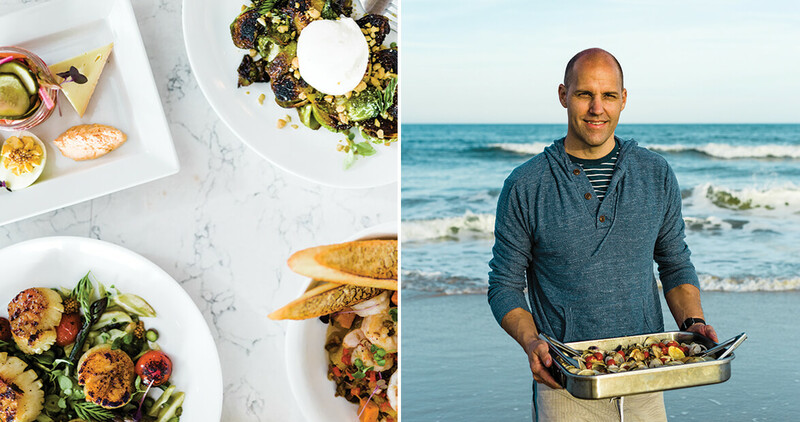 Craig Love has turned surf culture into his own culinary style. Now, he’s got a kitchen full of surfers — from managers to cooks — who share his deep appreciation of the sea and all that it provides. 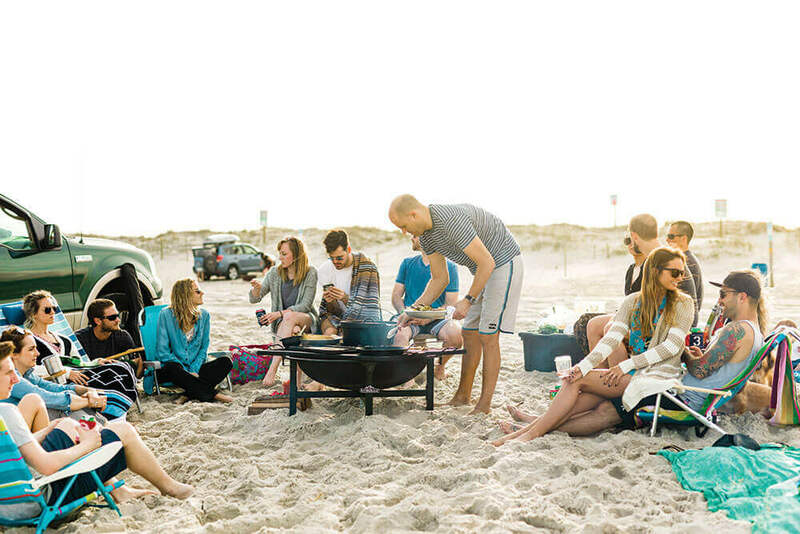 Several times a summer, when the restaurant is closed, Love hosts a surf day and beach cookout for his staff. They load up their four-wheel-drive trucks with boards, beach chairs, and coolers stocked with everything they’ll need for a sunny afternoon by the sea. More often than not, they head to Freeman Park on the northern end of the island. 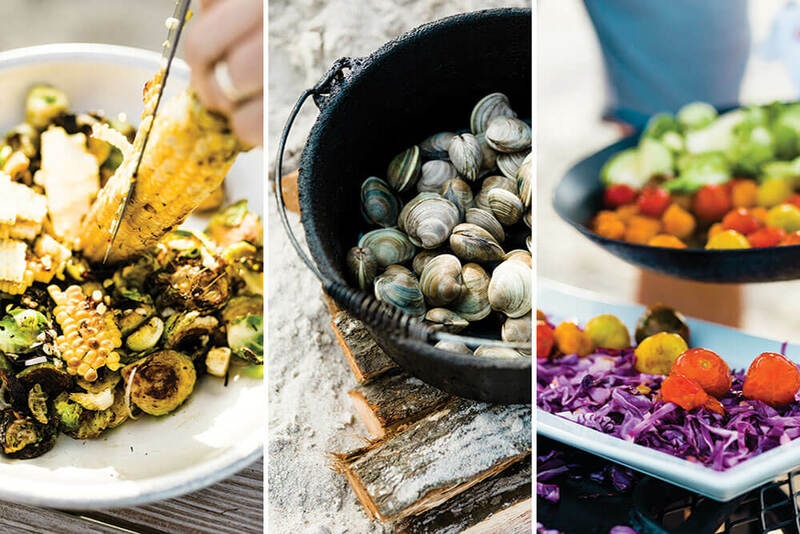 Love sets up his wood-fired grill in the sand, and the feast is on: beer-steamed clams with roasted cherry tomatoes and garlic; grilled shrimp with corn, chorizo, and basil-lime butter; seared grouper slathered with pesto; grilled baguette slices; and a salad of charred red cabbage, blistered tomatoes, and pickled vegetables. The surf-loving ethos isn’t surprising if you know Love’s path to Carolina Beach. He grew up in Richmond, and as a teenager, he would skip school to head to Virginia Beach, where he was first exposed to surfing. His seven-year college journey brought him to Wilmington in 1999, where he ended up working at the beloved but now-closed Caffe Phoenix. There, he fell in love with restaurant work — which, as it turned out, is not that different from surfing. For Love, surfing is best when all the elements come together (wind, time, consistent waves), and cooking on a line in the kitchen is the same: It’s best when the front of the house and the kitchen are in sync. There’s a rhythm to a good night in a restaurant. Reservations are evenly spaced out over the course of the evening. Tickets are fired at the right time, so as not to overwhelm the line cooks. “When it’s all working well together, you get the same sense of satisfaction,” Love says. After four years in Wilmington, Love began his culinary education in earnest, spending three years at Cancan, a well-regarded French brasserie in Richmond, and a short stint at New York’s Gramercy Tavern. Eventually, the beach life called to him, and he moved to Carolina Beach. When Love opened Surf House in 2009, it was actually a café — serving well-crafted sandwiches, salads, and soups — as well as a surf shop. In fact, Annalee Berry, now the restaurant’s general manager, remembers having to answer questions during her initial job interview about how to recommend surfboards to people. It wasn’t uncommon in those early days for a sign to appear on the door that said: “Sorry, we’re closed for a board meeting. 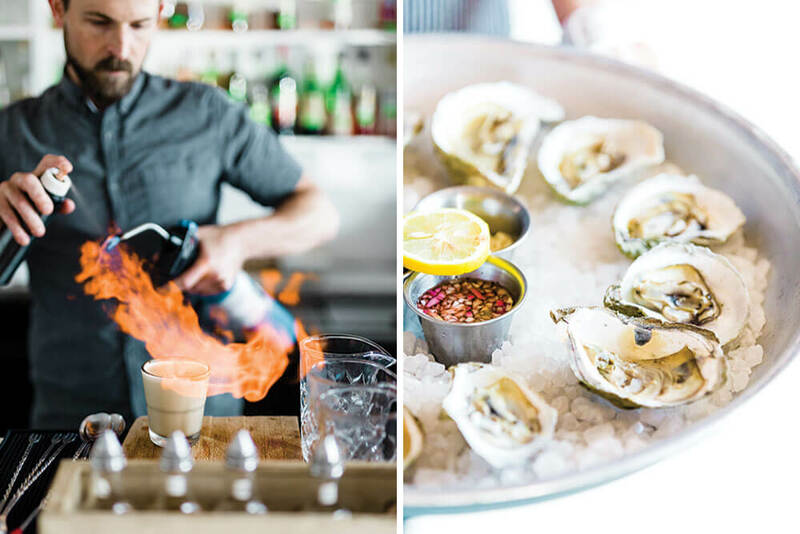 Be back in a few hours.” Eventually, the surf shop business took a hit from online retailers, and Love remodeled the space to be a dinner-only upscale restaurant, which has done well enough to stay open year-round. Even without a surf shop, Surf House attracted a staff of surfers. Berry grew up in Carolina Beach and has been surfing since she was a high school freshman. Gregory Ewan, the bar manager, grew up in Raleigh, but he and his friends would get up early on Saturday mornings to drive to Wrightsville Beach and be surfing at Johnnie Mercer’s Pier by sunrise. 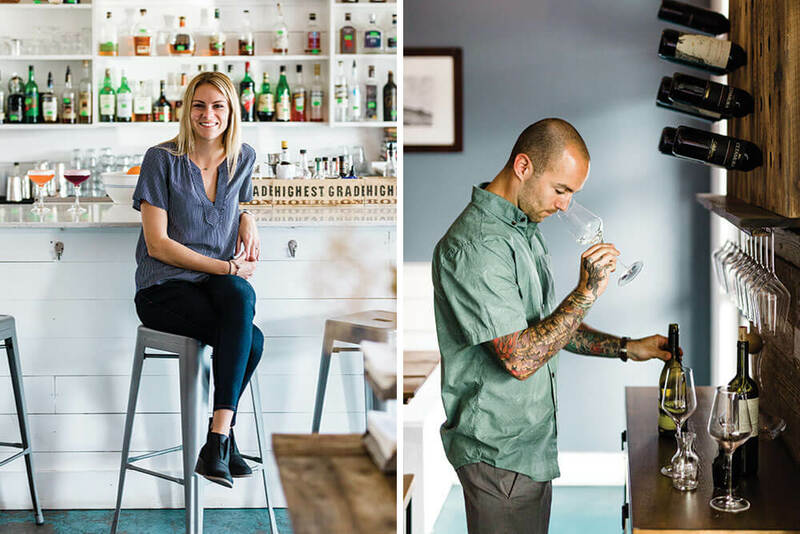 Then there’s Castelluzzo, the wine director, who grew up in New Jersey surf culture. His love of surfing took him all over Mexico, Central America, and the Caribbean. He spent two years in Puerto Rico, running a smoothie and acai bowl stand for a family whose daughter, Quincy Davis, is a professional surfer. “I took surfing a little too seriously for about five years,” Castelluzzo explains. Weigl, a Pittsburgh native, came to the South to be a courthouse reporter. But it didn't take long for her to find her true loves: pimento cheese, shrimp and grits, and biscuits and gravy. She now writes about food for various publications and manages the food blog for newsobserver.com in Raleigh.